Andre Drummond is quickly gaining a reputation as one of the Eastern Conference's best big men. The last piece of the 2004 championship team, Tayshaun Prince, got traded to the Memphis Grizzlies in January. The playoff drought then continued in April, sending the old coach, Lawrence Frank, packing and bringing in a new one, Maurice Cheeks. Offseason trades and free-agent acquisitions have bolstered a roster that Joe Dumars seems content on building on the foundation of up-and-comers Greg Monroe and Andre Drummond. If the current trends continue, the Pistons could very well return to the playoffs for the first time since 2009. Drummond was a controversial pick in the 2012 draft, because teams feared that he didn’t have the desire and motor to make full use of his unquestionable physical ability. By the end of the 2012-13 season, though, all of those questions had been answered. Drummond didn’t get a huge amount of playing time as a rookie, between a back injury and Lawrence Frank’s decision to limit him to around 20 minutes a game, but his per-minute rebounding and scoring stats were off the charts. This season, playing starter’s minutes, he’s kept up that same pace, and is quickly gaining a reputation as one of the Eastern Conference’s best big men. At 20, he’s still got a lot to learn — Dwight Howard schooled him for 34 points and 19 rebounds in December — but he’s hasn’t complained. At the end of that loss to Houston, Drummond thanked Howard for the lesson. There weren’t a lot of highlights in the 29-53 season that got Lawrence Frank fired, but the Pistons did put together a four-game winning streak at the end of the year. With Drummond and Greg Monroe together in the starting lineup, Detroit knocked off Chicago, Cleveland, Charlotte and Philadelphia before losing the final game of the season at Brooklyn. Monroe and Drummond didn’t have Josh Smith yet, but they showed signs of what was coming. Monroe had 27 points and 16 rebounds in the win over the Sixers, while Drummond had 29 and 11 against Cleveland. After the struggles of Michael Curry, John Kuester and Lawrence Frank, Joe Dumars didn’t have the luxury of missing on another coaching hire. That’s why he went with a veteran in Maurice Cheeks — one of the best point guards of the 1980s and an NBA champ as a player, and a veteran of eight seasons as a coach. Cheeks was coming off a very successful stint as an assistant in Oklahoma City that gave his career a boost after five straight sub-.500 seasons as a head coach. Cheeks has never won a playoff series, but he’s gotten the new-look Pistons within touching distance of .500 for the first time in years. At the end of last season, it was obvious that the new coach was going to need a new roster. Dumars had been building cap space to go after a couple prime-time free agents, and his biggest acquisition was long-time Atlanta forward Josh Smith. 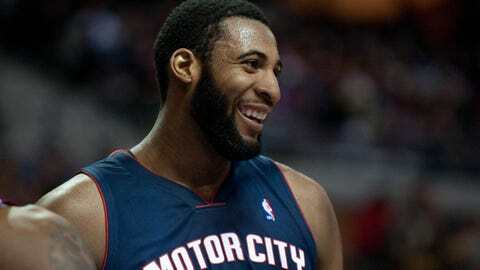 Smith signed a four-year, $54 million contract to play on a formidable front court alongside Drummond and Monroe. He struggled early in the season to adjust back to playing small forward — he had spent most of his time in Atlanta at power forward — but he picked things up by mid-December. averaging 23.6 points and six rebounds in one five-game stretch. When Michigan All-American Trey Burke was still on the board when the Pistons were ready to make the eighth pick in this summer’s draft, Twitter began to explode with joy. Months after leading the Wolverines to the national-championship game, Burke was going to be doing the same thing for the Pistons. Dumars, though, had another idea. He drafted Georgia shooting guard Kentavious Caldwell-Pope, hoping to find the pure shooter the team has lacked in recent years. The move still hasn’t won over Pistons fans — Caldwell-Pope is struggling against NBA defenses while Burke has put up some big games for Utah — but KCP has already earned a regular spot in the starting lineup and might be Detroit’s best perimeter defender. If Pistons fans were disappointed when it became clear that Trey Burke was going to be the point guard, Dumars had a consolation prize for them. He wanted a veteran leader and teacher to work with his young guards, and he knew exactly where to look. Chauncey Billups was the leader of the 2004 championship team, and now he’s back in the familiar #1 jersey. He’ll be the first to admit he’s not the same player he was a decade ago — he’s struggling with a bad knee and his jumper isn’t the same — but he has been a resource for players like Caldwell-Pope and Brandon Jennings. Dumars knew that Billups wasn’t able to be a full-time point guard, so he made his last major move of the offseason, trading Brandon Knight, Khris Middleton and Slava Kravtsov to Milwaukee for the mercurial Brandon Jennings. Jennings is certainly not a traditional pass-first point guard — he’s better known for his 55-point game as a rookie than for assists — but he gave the Pistons another offensive weapon to go along with Smith and Monroe. He also has the benefit of working with Cheeks and Billups, who are trying to get him to look for his teammates instead of just his own shot. The experiment has had mixed success, but he’s reached double digits in assists on numerous occasions without racking up huge turnover numbers. The Pistons have been plagued by slow starts in the past few seasons, so fans were only cautiously optmistic when the new-look roster made its debut on Oct. 30 against the Wizards. A crowd of 18,891 fans, though, got a treat as Detroit took an early lead and cruised to a 113-102 win. Monroe was the star of the night, putting up 24 points and 16 rebounds, while Smith and Will Bynum (playing for the injured Jennings) had 19 each. Billups added 16, Drummond had 12 points and eight rebounds and Caldwell-Pope pitched in nine in his NBA debut. In the current NBA, there is only one measuring stick — the Miami Heat. If you want to be considered a title contender, you are going to have to be able to get past LeBron James, Dwyane Wade and Chris Bosh. The Pistons aren’t to that point yet, but they still made a statement in early December when they went to Miami and posted a 107-97 victory. This game had a different set of stars than the opener, as Kyle Singler and Rodney Stuckey combined for 34 points off the bench while Drummond outrebounded Bosh 19-6. Wade didn’t play, but the Pistons held LeBron in check, limiting him to 23 points and six assists to go along with six turnovers. Less than two weeks after winning in Miami, the Pistons did something that no other NBA team had managed when they won 101-96 in Indianpolis. The Pistons had blown a big lead in a heartbreaking loss to Portland on Sunday night, but bounced back 24 hours later to stun the 20-3 Pacers. It was the two big offseason pickups that carried Detroit to the win, as Smith and Jennings combined for 48 points. Monroe, Drummond and Josh Harrellson had 31 rebounds, and Detroit held MVP candidate Paul George to 17 points on 4-of-14 shooting.